NOTE: This unit is EOL and has been replaced by the Sensaphone Sentinel Monitoring System with Cellular Modem. 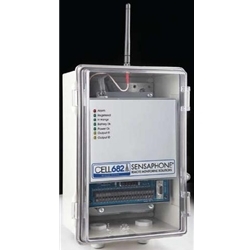 If you would like to order a Cell682, while supplies last, please contact us and we can help with the order. Please also note Verizon will be sun-setting their 2G/3G Networks Dec 31, 2019 and will not activate any 2G/3G devices on their network after June 30th 2018. Although we do not have any verified information as to what AT&T plans are for their 3G network it is advisable to purchase all future equipment in 4G versions so you get the most life out of your equipment.